The first thing I did upon preparing for this review was to look up my review of Jurassic World. Thankfully, it came with correct opinions already firmly in place: the treatment of the female lead was abysmal, the children were badly tacked on, the dinosaurs and action disaster portions were exactly what I wanted them to be. So, it was a flawed film that I can understand would have been far worse to people who were unconcerned by the primary focus. Therefore, I have pretty good news! 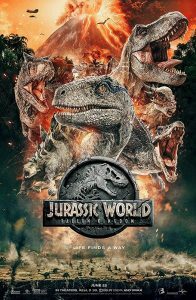 The recent new sequel, Jurassic World: Fallen Kingdom, has the same strengths and virtually none of the flaws of its predecessor. We pick up with the same two lead characters three years later, deciding what to do as the world learns that Isla Nubar’s volcano is no longer dormant, and all the dinosaurs are about to go extinct, y’know, again. I’m not going to pretend there’s much tension as to their decision, but having established that some people are going to an exploding island to rescue some dinosaurs from oblivion, I’ll leave the plot at that instead of delving into any details of the remaining acts. Which is, ultimately, the other really good thing about this movie besides that it fixed its progenitor’s flaws: Fallen Kingdom has an emotional core, around the literal fact of dinosaurs dying and dying out. Not only did I care about some of the characters, I absolutely cared about the dinosaurs. (Not just the one with a name.) I’m sad if this movie isn’t doing well, because it deserves to be. …which is more than I can say for the trailers. I really hate movie trailers. I’m not thinking very hard about how you get that doctorate / degree sans practical application training. I’m also judging you if you are thinking about it very hard. This entry was posted in Film and tagged action, Alamo Drafthouse, sci-fi on July 11, 2018 by Chris. When you want to know absolutely everything there is to know about everything... well, okay, you should probably check with Wikipedia Pete. But when you want to know everything that our own Mr. Chris Hammock (yes, that one) thinks about entertainment that he has consumed recently, then you'd definitely come here. Or maybe to a Google cache or that internet archive thing. But preferably here. The things we do make echoes. When you say words a lot they don’t mean anything. Or maybe they don’t mean anything anyway, and we just think they do. There are things not in your book. There are paths outside this garden. There must be a word for it … the thing that lets you know time is happening. Is there a word?